Llewellyn David Roberts was the second of four children born to David & Maria Roberts who, in 1916, were living at Oak Cottage, Hope. Until settling in Hope , the family seemed to have had a very transient life! Llewellyn’s father David was born in Rhyl in 1853, and his mother Maria (nee Cook), was born in 1865 in Cheltenham, Gloucestershire. In 1871 & 1881 David is living in Liverpool, while Maria is still in her home town of Cheltenham. Following their marriage in St Mary’s Church Paddington on 12th September 1891, they had their first two children – Gladys Lydia Sarah b.1893 and Llewellyn David in 1894, both born in Kilburn, North London. David was involved in the printing industry and Maria was a school teacher. The first time we see Llewellyn in the Census is in 1901 when the family are living in Etherley Road Tottenham, North London. Llewellyn is 7 years old, and his sister Gladys 8. David is still involved in the printing industry with his occupation declared as ‘Printers Ink Traveller’. There is no occupation listed for Maria at this time. By 1905 the family had moved to Hope as their third child, Olwen was born here, followed by Gwennole a year later. In 1911, the family are not together on the night of the census. Maria, and the three girls are all together in Hope. Maria’s occupation is ‘Council School Teacher’. Gladys is now 18, but there is no occupation listed for her. The two youngest girls are now 6 and 5 years old. David & Llewellyn meanwhile are boarding in 7, Anson Street, Liverpool. David is a printer, and Llewellyn who is now 17, is a ‘Confectioners Clerk’. From his obituary in the Chester Chronicle on 17th June 1916, we know that Llewellyn volunteered into the army in about 1914. He enlisted in Wrexham into the 13th Battalion, Royal Welsh Fusiliers – Private 15867. His Battalion was part of the 38th (Welsh) Division, which was formed of volunteer units. He trained with the Pals Battalion of the RWF in Rhyl and Llandudno & from there he went to Winchester. From his medal card we know he arrived in Le Havre, France on 1st December 1915. On 31st May 1916, he received wounds to his chest, but was able to write to his mother and hopes were that he would recover. He died from his wounds on 6th June 1916 – though some documentation says 5th June. 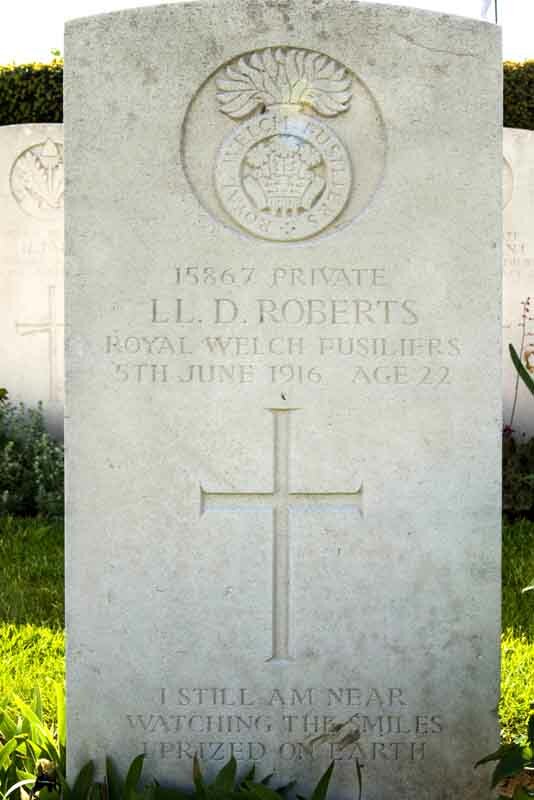 In the same paper above the obituary under the heading of “Roll of Honour, Killed in Action” it reads : “Roberts – In fond memory of Llew. David Roberts, the only and dearly loved son of David and Maria Roberts, the only and dearly loved son of David and Maria Roberts, of 1, Hawarden Road, Hope Village (Caergwrle), who gave his life for his country somewhere in France, June 6th, 1916. Llewellyn was awarded the Victory Medal, the British War Medal and the ’15 Star. On his medal card the date of his death is given as 5th June 1916.